While visiting Blithewold this season, take a moment to browse the colorful array of practical and luxurious offerings at The Shop at Blithewold. The Shop is filled with a wide collection of unique, elegant items, such as ladies’ accessories, handmade jewelry, tabletop adornments, Blithewold-inspired keepsakes, and much more. Blithewold strives to support the local economy; you’ll see that many of our items are sourced from the Rhode Island and New England community. Some of our items are also made by our own talented volunteers! Remember to mention that you are a Blithewold member to receive your 15% member discount. BLITHEWOLD: Legacy of an American Family is a social history of four generations of an American family, from 1810 to 2010, and the legacy they left in the form of Blithewold Mansion, Gardens & Arboretum. Blithewold is a spectacular 33-acre estate on the shores of Narragansett Bay in Bristol, Rhode Island, known as New England’s finest sea-side garden estate. The estate’s large archival collection of letters and photographs are used to illustrate this remarkable story. 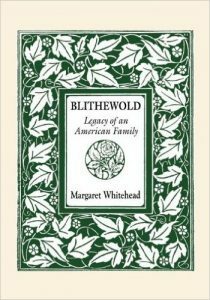 To purchase Blithewold: Legacy of an American Family by Margaret Whitehead, click here. In June 1903, 19-year-old Marjorie Van Wickle embarked on a journey that profoundly changed the course of her life, leading to life-long passions for art, music, and horticulture. For eleven months, she traveled with a chaperone through Europe and Egypt, touring capital cities, small towns, and villages; visiting art museums, historic sites, and legendary monuments. The book is constructed around excerpts from letters and postcards Marjorie sent home to her mother. 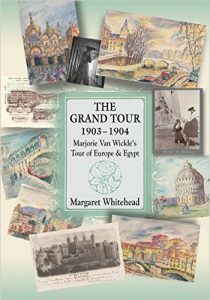 To purchase The Grand Tour 1903 – 1904: Marjorie Van Wickle’s Tour of Egypt and Europe by Margaret Whitehead, click here. Make sure to leave time during your visit to stop by The Shop at Blithewold.